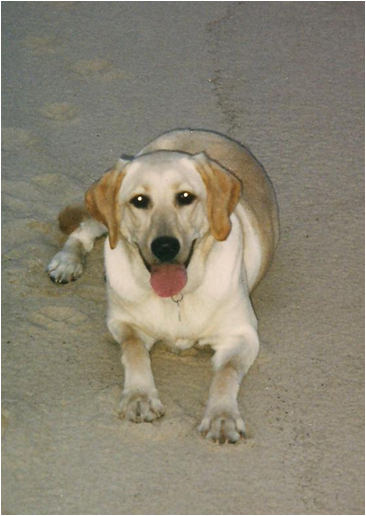 Well here I am again, in a familiar albeit heavy hearted state–writing a tribute to a beloved family member–our dog, Mandy. 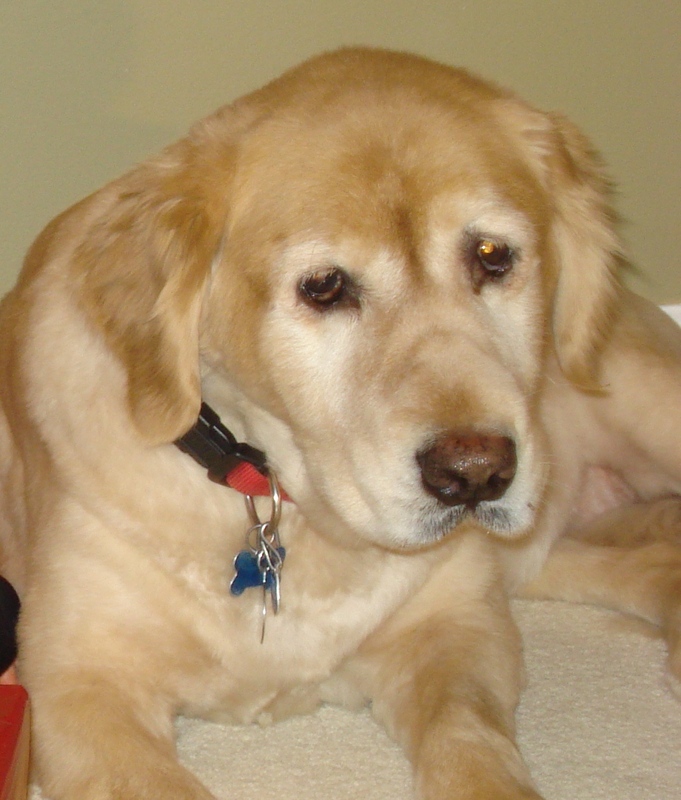 Some eight months after saying good bye to our golden retriever, we now bid farewell to our yellow lab. Sweet Mandy is surely in a better place, or at least that’s what I choose to believe. And if I had to guess what her Heavenly experience resembles, I’d wager there are sand dunes, lake waters and wood-burning fireplaces at every turn. On Friday night we had to make that decision that millions of pet owners before us have reluctantly had to. We put Mandy to sleep when it became clear beyond the shadow of a doubt that keeping her with us was causing her suffering. I had always imagined with both of my dogs that I’d be there to stroke their ears as they took their last breath, but in neither case would fate allow for it. With an infant and a toddler now in our household, only one parent could get away to take Mandy to the 24-hour emergency veterinary hospital. And rightfully it was the guy who first came upon her as an eight-week old pup, the last remaining member of her litter to be claimed. This is the guy who would so successfully train her that she’d never need to walk on a leash, would stop on a dime if told to halt and obeyed every command ever directed her way. I suspect he wanted to be alone with his girl to say their good byes. How could I argue that? So my good bye to Mandy took place in the driveway as I helped hoist her failing 90 pound body into the back of our Saturn Vue for her last ride in the car–an activity she had always enjoyed throughout her life. I had only a few seconds to kiss her nose and hug her to my chest before I had to run back inside to make sure our two-year-old wasn’t lying on top of our six-week old. It wasn’t enough of a good bye for a pet that to me was more like another child in many ways, but to prolong our parting would have only prolonged her pain. I’ve known Mandy about as long as I’ve known my husband. It was she who first greeted me when I made the first trip to my then boyfriend’s home in Chesterton, Ind., when we were newly dating. I was a bit nervous–making this trip from the city to the 219 area code meant we were getting serious. All my nerves went out the window though when a friendly yellow lab greeted me in the driveway putting this dog lover at ease in an instant. I can assure you that the stories of Mandy and her big heart are many. She was loved by all who ever met her. She was Lassie to our golden’s Marley personality. My husband used to call her the goodwill ambassador, and I can’t think of anything that more accurately describes her nature. We had many other nicknames for her, including “D,” Deeter dog, Mandino and the yellow dog under the bed–(the impetus for a children’s book series I’ve been working on), and I’m sad that I’ll never again be able to call them out and hear the tags on her collar clink in response as she scampered my way. Mandy loved more than anything to be outside. When I first made her acquaintance, she’d literally tremble for joy en route to the Indiana Dunes State Park to climb and then descend the dunes headed at full speed toward the waters of Lake Michigan. Later when she and her dad moved to Michigan where I had relocated, she enjoyed walks around our neighborhood–anything that would allow her fresh air and a chance to play fetch with a tennis ball or frisbee. More than once Mandy served as courier between her dad and me. Stressing out over a statistics assignment that had me on the verge of a nervous breakdown during grad school, I looked up one afternoon to see Mandy headed my way with a red rose from dad tied to her collar. Who couldn’t feel a little better with that visual in mind? On another occasion, she couriered a note from my husband to me with some words of love and encouragement that I’ve now since forgotten, but the sentiment is still very much remembered. Mandy was a teddy bear at heart but was also an astute watchdog letting us know when a stranger was at the door. And when we expanded our family and our infant daughter would fuss, Mandy would pace the floor like a worried mother. She was our ultimate protector, and I don’t doubt that if an emergency had ever arisen, she would have done everything in her power to assist. Mandy was everything a dog should be, and she is already missed. Seeing her tattered bed out with the garbage cans this morning literally caused my stomach a moment of pain And coming upon her red collar and leash on the counter has had me closing my eyes for a moment to acknowledge again that it’s better for her–and–us–that she isn’t here anymore, not in the state she had been in. The state that had not allowed her to go on a walk in several years. The state that meant if she wanted to join us in our bedroom in her home under the bed that we’d have to carry her up to that spot. The state that meant we’d hear that labored breathing only intensify with time. So, she has joined her pal Riley on the other side. And one thought that has made me mentally smile since her passing is that some day (hopefully a day far from now) when I go to that side, I’ll be greeted by wagging tails full of enthusiasm. And a fuzzy yellow goodwill ambassador will be there to show me the way to all His wonder. Our little family became a little littler today. Riley was our problem child–a ball of energy, mischief and perpetual hunger wrapped up in 79 pounds of fur and just about the cutest face you ever did see. I wish I could share with you stories of her stellar behavior or talk about how she brought out the best in everyone, but that’s simply not this golden retriever–not by a long shot. We picked one. A little female with a stripe down her snout. We named her Riley. Riley grew up hyper, as many goldens do. But her hyperactivity never seemed to lessen with time. Riley lived with my parents for several years, and then my sister took her in. We all thought that was a great idea. As a runner, my sister could help Riley expend some of that overwhelming energy on long jogs. A few years later though, Riley changed hands once again and became mine. The country dog turned city dog when she moved into my brownstone apartment in Chicago, where I was living single and enjoying the bustle of urban life. Riley loved to be petted. Many evenings as I typed away on my laptop while sitting on the family room floor, she’d saunter over to me, pause and then plop her hiney directly on my keyboard. She’d nudge my wrist and wait for the petting to begin. I remember my first car trip home to Michigan with her. In my naive way, I had assumed she’d spread out in the backseat and take a nap. But oh no. Riley wanted to be up front. No, not in the shotgun seat. She wanted to be on my lap, as I drove. Yup, I almost died as this 70+ pound fur ball finagled her way on to my lap on I-94. Needless to say, a kennel was quickly purchased to keep her contained on future five-hour drives home. But perhaps Riley is most well known for her eating habits. The stories of “What Has Riley Eaten Lately?” have made many people laugh and left many others astounded that she actually was still alive. Among the non-edible items Riley has eaten are a highlighter, a copy of The Very Hungry Caterpillar, my Northwestern vs. Michigan football tickets, an 18k gold bracelet, a wad of cash, a full baseball mitt (yes you read that correctly), a size 18-month dress and accompanying bloomers, numerous dish towels, the linoleum of my parents’ kitchen floor, and way too many socks, wash cloths and bibs to count. If any of this sounds vaguely like a dog you know, let me help you out. Marley. You know, from Marley and Me? Riley is Marley’s female counterpart. She could eat and eat and eat and eat until the cows came home. She can (and has) pulled people over while running on a leash. And while she earned numerous blue ribbons in obedience school, she rarely listened at home. But she loved me–I have no doubt about that. And she had a great heart. There’s nothing quite like watching your dog struggle to take in her last few breaths. While I am the first to admit Riley was far from perfect, I am so glad I was the last one to own and love her. She really did better my life. As I attempted to regain composure this morning after my husband washed off Riley’s red collar and tags so I’d have a memento of my friend, I decided I needed to say one last good bye to the Riley dog. I went out to the garage where she was lying on a soft green blanket and touched her one last time. The waterworks unleashed once more. And ever one to provide comic relief, my husband said, “Babe, she’s already in Heaven eating Jesus’ sandals.” And, you know what, I wouldn’t doubt that he is right. So long my friend! Thanks for the memories–good and bad. You are already missed.